One of the most important aspects of Birmingham United’s programming vision is the support we provide our players as they strive to reach their personal goals. As you can see from the list below, for many players those goals include playing soccer in college. If you have the goal of playing college soccer, you’ve found the right place to start! BUSA’s College Placement Program has all the information and resources needed to make this dream come true! Refer to the menu on the right hand side of this page of all the information you need about the recruiting process, roles and responsibilities of individuals, important things to consider in choosing a school, and timelines to follow that will increase your chance of having an awesome college soccer experience. 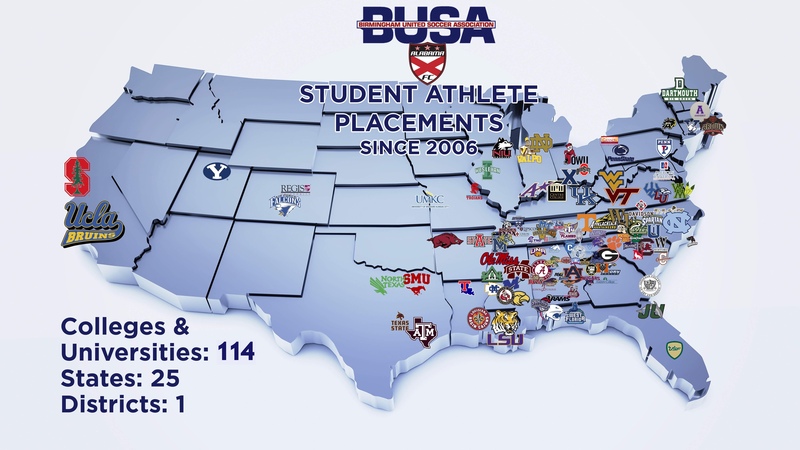 Click here to see where former BUSA players are playing College Soccer in the U.S.
Be proactive and take responsibility of the process! This is your dream! Follow the recruiting timeline to stay ahead of the game. Follow through with your communication! This is one thing that tells college coaches (your club coaches and parents too!) how much you want to really play! Stay on top of this! Keep the recruiting process to yourself – there is no need to brag about the schools you are talking to or visiting. Beware the negative effects of Social Media! If you have any hesitation about posting something on social media, DON’T!! College coaches do their research! Once something is posted, you never know how has seen it! Maintain your grades – academics & athletics go hand-in-hand! WHAT DO PARENTS NEED TO DO TO HELP THEIR CHILD PLAY COLLEGE SOCCER? Enable your child to take responsibility of the process – do not do it for them! Provide oversight and stay in communication with players and club coaches. Keep your child realistic about school choices – you know them better than they know themselves! Let the kids communicate with college coaches. The coaches want to know the kids really want to play! WHAT DO YOUR CLUB COACHES DO TO HELP IN THE PROCESS? Follow up with players, parents, and college coaches regarding things are in the recruiting process. Give players playing time at showcase events so they are seen by college coaches. The score in games only provides college coaches context for what they are watching! Always compete no matter the score! Help ensure Team Profiles are up-to-date and accurate for games and events. Be HONEST with players and college coaches – our credibility is on the line! Social Life – can go hand-in-hand with school size. Explore the local town or city to see what life is like outside of the classroom and off of the field. Maybe you need an escape from time to time or maybe you prefer to have fewer distractions. Sororities and Fraternities aren’t at every school and may not be something that strikes your fancy! After all, you have a family with your soccer team! Look into the campus life section on the school website for more info. Spiritual Life – Would you prefer attending a school with a religious affiliation? If the school you are considering has a religious affiliation, look into the requiremtns the school has in place. Some schools are more rigid than others in this area and it is important to know what you must fulfill each semester to graduate. Climate & Weather – what type of weather do you like and dislike? If you are intolerable of cold weather, you probably should cross off those schools in the northeast! Likewise, if you can’t stand the heat, Arizona may not be for you! Admission requirements – academic requirements may be one of several areas you need to know about. Some schools require letters of recommendation, while others require less. Athletics – last but not least, what type of program are you looking for? Are you okay waiting your turn to play or do you want to make an impact right away? These are important questions to ask the coaches so you know where you stand before you arrive on campus for preseason. research the number of graduates the program will have the year before you enter as a freshman. The following timeline for GIRLS serves as a guide to making your dream to play college soccer come true. Following this timeline provides a surefire way to stay on top of the recruiting process, which can be a daunting task! Start early and stay ahead! Begin positive road in academics!! Participate in extracurricular activities at school, etc. The following timeline for BOYS serves as a guide to making your dream to play college soccer come true. Following this timeline provides a surefire way to stay on top of the recruiting process, which can be a daunting task! Start early and stay ahead! YOU’VE IDENTIFIED A SCHOOL YOU ARE INTERESTED IN AND WANT TO REACH OUT TO THE COACHES… NOW WHAT? First, make sure you are aware of the rules regarding communication with the coach you are reaching out to. This will let you know what you can expect in return and is a good place to begin your communication. NCAA Division each have their own rules and NAIA and NJCAA are also different. Know who you are talking to – research, research, research!! When sending the first, introductory email, let them know what you like about their school & program and why it would be a good fit for you. Include quick items like your GPA and test scores. Give them a quick overview of your upcoming schedule especially showcase events you are attending. Keep your communication regular, but not overbearing. Before and after events or games the college coach is attending is sufficient. As always, if you have any questions contact your respective program director! Is the school your are considering part of the NCAA? If so, see below for links to important information about the NCAA and recruiting. And remember, there are three divisions in the NCAA! Make sure you know which one your school is a part of as each has their own rules! Does the school you are looking at belong to the NAIA? If so, look below for links to important information! The National Junior College Athletic Association may have the best choice for you to begin your college soccer career. For more info, see below!